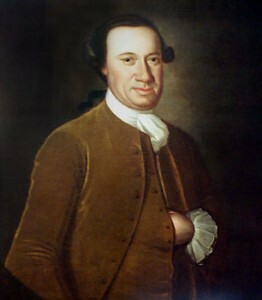 John Hanson President of the Continental Congress under the Articles of Confederation following the American Revolution. In 1782 he issued the following proclamation declaring the fourth Thursday of November a day of thanksgiving. It being the indispensable duty of all nations, not only to offer up their supplications to Almighty God, the giver of all good, for His gracious assistance in a time of distress, but also in a solemn and public manner, to give Him praise for His goodness in general, and especially for great and signal interpositions of His Providence in their behalf; therefore, the United States in Congress assembled, taking into their consideration the many instances of Divine goodness to these States in the course of the important conflict, in which they have been so long engaged, — the present happy and promising state of public affairs, and the events of the war in the course of the year now drawing to a close; particularly the harmony of the public Councils which is so necessary to the success of the public cause, — the perfect union and good understanding which has hitherto subsisted between them and their allies, notwithstanding the artful and unwearied attempts of the common enemy to divide them, — the success of the arms of the United States and those of their allies, — and the acknowledgment of their Independence by another European power, whose friendship and commerce must be of great and lasting advantage to these States; Do hereby recommend it to the inhabitants of these States in general, to observe and request the several states to interpose their authority, in appointing and commanding the observation of THURSDAY the TWENTY-EIGHTH DAY OF NOVEMBER next as a day of SOLEMN THANKSGIVING to GOD for all His mercies; and they do further recommend to all ranks to testify their gratitude to God for His goodness by a cheerful obedience to His laws and by promoting, each in his station, and by his influence, the practice of true and undefiled religion, which is the great foundation of public prosperity and national happiness.